·Currently available diagnostic methods for pityriasis versicolor include KOH mount and culture on Sabouraud′s agar. ·KOH mount however lacks a color contrast, while culture is time consuming and has low sensitivity. Pityriasis versicolor is a chronic, usually asymptomatic, recurrent infection of the skin caused by a dimorphic lipophilic yeast belonging to genus Malassezia. , It is characterized by hypo- or hyperpigmented coalescing scaly macules usually on the trunk and upper arms. Occasionally, it may mimic conditions like pityriasis alba, progressive macular hypomelanosis, vitiligo (especially early lesions) and rarely, mycosis fungoides (early patch stage). 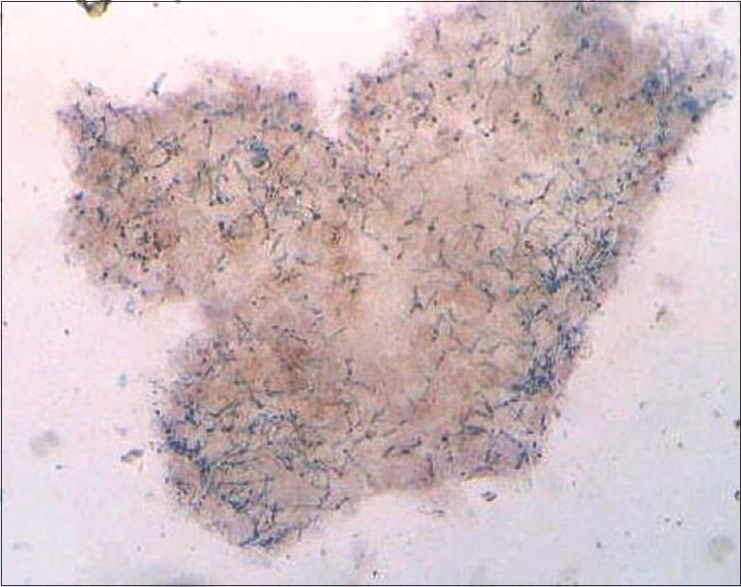 Laboratory examination of skin scrapings demonstrating the fungal hyphae and spores helps in avoiding unnecessary biopsies and delays in the diagnosis and treatment in such cases. In this study, we compared the standard laboratory tests, viz. KOH mount and culture with CSB stain of lesional skin scrapings in the diagnosis of P. versicolor. The objective was to determine the sensitivity and specificity of CSB stain using KOH mount as reference method and to compare the efficacy of CSB stain, KOH mount and culture for the diagnosis of P. versicolor. The study also aimed at determining the level of agreement between KOH mount, CSB stain and culture in diagnosis of P. versicolor. Clinically diagnosed cases of P. versicolor, of all age groups and both sexes, who consented for the study, were included. Clinical diagnosis was based on the presence of characteristic hypopigmented/hyperpigmented/erythematous/achromic macules or patches with fine branny scaling present over the face, neck, trunk or extremities with positive Besnier's sign. (1) Patients not consenting to be a part of this study, (2) atypical cases who did not fit the inclusion criteria and (3) patients who had taken treatment with oral or topical antifungals in the past 1 month. Institutional ethics committee permission was obtained for the study. A total of 100 clinically diagnosed cases of P. versicolor of all age groups were included in the study after written informed consent of the patients. Skin scrapings from the lesions were subjected to (1) 10% KOH mount, (2) 1% CSB staining with 10% KOH as clearing agent and (3) culture on Sabouraud's dextrose agar (SDA) with chloramphenicol (0.005%) and cycloheximide (0.05%) with and without olive oil overlay. Preparation of the CSB stain: CSB stain was prepared by dissolving 1 gm of the CSB dye in 100 ml of distilled water forming 1% solution. Areas of skin to be scraped were first cleaned with a swab dipped in absolute alcohol to remove traces of creams and reduce bacterial contaminants. The scales were collected by scraping the lesion with the blunt edge of no. 15 scalpel blade and placed on two clean glass slides. A drop of 10% KOH was added to both the slides. A drop of 1% CSB stain was added to one of the slides. A coverslip was gently pressed and excess of stain was blotted with the help of blotting paper. After waiting for approximately 20 min at room temperature, a microscopic examination was done under scanner view (4×), low (10×), high power (40×) and oil immersion (100×) objectives of the ordinary microscope. 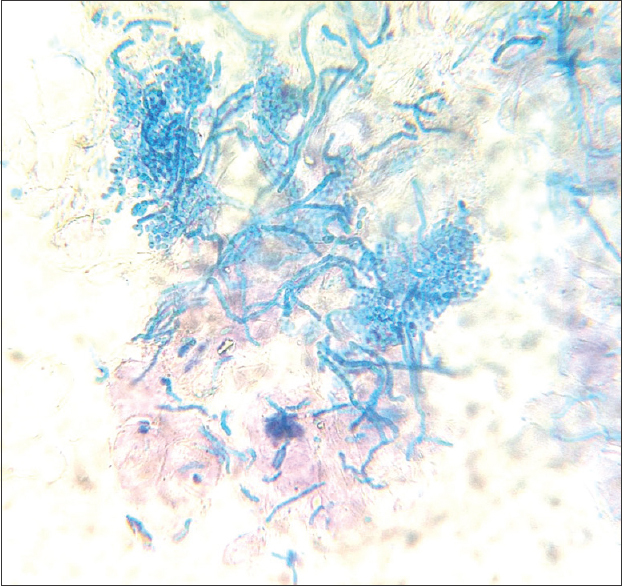 , The mount was considered positive for Malassezia, if short blue staining septate hyphae, arranged at an angle or end to end, with clusters of spherical spores were seen (spaghetti and meatball appearance). Each of the slides were examined by the first author for the presence of hyphae and spores. The diagnosis was also independently confirmed by the second author. Similarly, the slides of KOH mount were examined for hyphae and spores. Samples from all the cases were collected with a blunt scalpel onto a sterile black card paper. Skin scrapings were inoculated on two plates of SDA with chloramphenicol and cycloheximide using the sterile bacteriological loop. Sterile olive oil was dropped into one of the SDA plates to form an oil layer using a sterile Pasteur pipette. Both plates were incubated at room temperature for 2 weeks. If no growth was observed after 2 weeks, the plates were discarded and considered negative for culture. Positive growth for Malassezia was taken as creamy, moist, pasty growth on the plates. To confirm, a smear from the colonies was stained with Gram's stain and observed under microscope (100×) for identification of Malassezia. 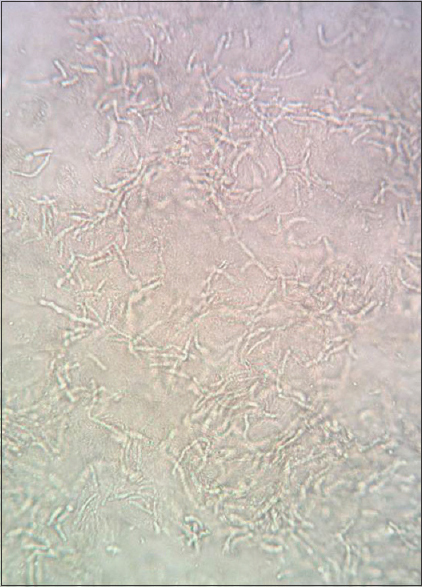 Unipolar budding, phialide yeast cells were taken as positive results. An interrater reliability analysis using the Kappa statistic was performed to determine consistency among different modalities for the diagnosis of P. versicolor and to exclude the agreement, which was merely due to chance. Also, sensitivity, specificity, positive predictive value, negative predictive value and accuracy of CSB stain and mycological culture were calculated using KOH mount as the reference method as it is the most commonly used and practical test available for the diagnosis of P. versicolor. A total of 100 patients (76 males and 24 females; mean age 27.8 years) were included in the study. Direct microscopy with CSB stain and KOH mount showed positive results in 98 (98%) and 92 (92%) of 100 patients, respectively. Mycological culture was positive in 56 (56%) patients. 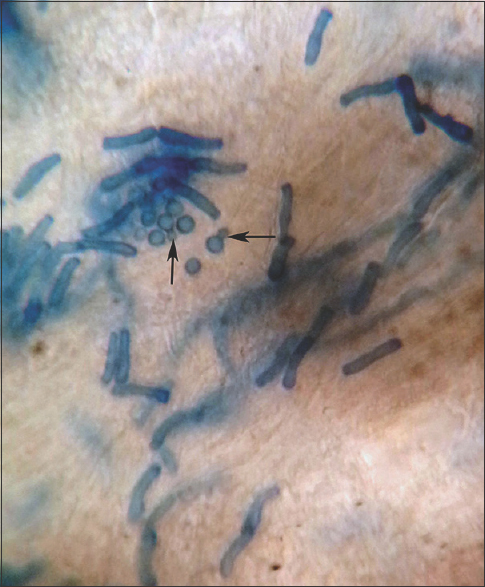 The fungal cell walls stained blue with CSB stain against the purplish background of cellular debris and were easily discerned even on scanner view (low magnification) [Figure 1] compared to the KOH mount. On higher magnification (10×), short and angular hyphae with clusters of spherical/flask-shaped yeasts were observed, giving the characteristic spaghetti and meatball appearance [Figure 2]. Darker staining was observed when the CSB stain was kept for longer time (30 min). Under oil immersion lens, the distinct morphology of the spores: Spherical shaped with narrow-based budding could be appreciated [Figure 3]. The KOH mount also showed the characteristic appearance of hyphae and spores, which were however seen clearly only on higher magnification (40×) as refractile structures and with no contrast against the surrounding cellular debris [Figure 4]. Culture on SDA with olive oil overlay yielded a growth of creamy, moist, pasty colonies in 56 (56%) cases. Smear from the colonies stained with Gram's stain showed unipolar budding, phialide yeast cells, characteristic of Malassezia [Figure 5]. SDA incubated without olive oil overlay yielded no growth in all 100 cases indicating all isolates were lipophilic. Statistical analysis: The sensitivity, specificity, PPV, NPV and overall accuracy of CSB stain and culture using KOH mount as reference standard are summarized in [Table 1]. 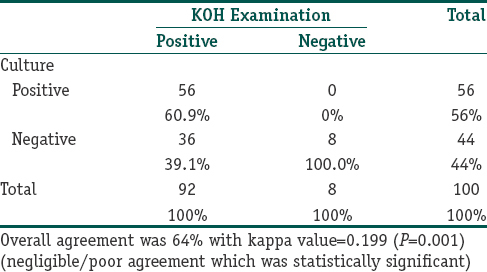 Using the Cohen's kappa statistical analysis, statistically significant fair agreement was found between CSB stain and KOH mount (94%, κ=0.38, P < 0.001). 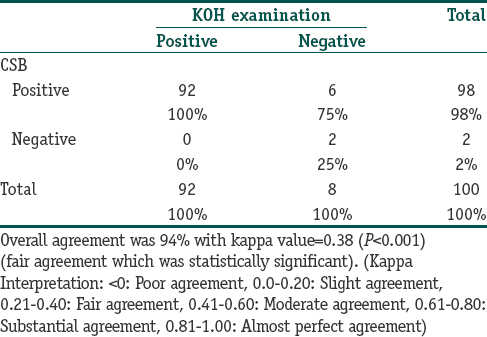 [Table 2] Negligible/poor agreement was found between KOH mount and culture (64% κ=0.199, P = 0.001) [Table 3] as well as CSB stain and culture (66%, κ=0.051, P = 0.107) [Table 4]. Pityriasis versicolor is a common, recurrent cutaneous superficial fungal infection. Rapid confirmation of diagnosis is desirable for patient counseling and to start prompt therapy without delay. The standard KOH mount, although rapid and inexpensive, does not produce a color contrast and requires a certain amount of skill and also time to interpret the smears. False negative reports may occur even in experienced hands in case of sparse fungal elements. Fungal culture requires special lipid-based medium and is time consuming with inconsistent sensitivity reported across studies. CSB stain, on the other hand by providing a color contrast, made it easy to locate the fungal elements even under scanner view. Another advantage over KOH is that it outlines the morphological features of both the spores and the hyphae and can enable detailed study of fungal morphology under oil-immersion microscopy. This might be potentially useful in differentiating between the Malassezia species and is an exciting area for further research by mycologists. The stain has also been reported useful in the diagnosis of dermatophyte and candidial infections. , The superior highlighting of morphological features could enable differentiation of dermatophytes, yeasts and non-dermatophyte molds, although this would require to be confirmed in further studies. Also, till date there are no reports of use of CSB stain in histopathological sections for demonstration of fungi. Considering the statistically significant fair agreement found between CSB stain and KOH mount, high sensitivity of CSB stain and qualitatively superior demonstration of fungal hyphae and spores, CSB stain can be used as a better alternative to KOH mount for the diagnosis of P. versicolor. Considering the low level of agreement between CSB stain with culture, high sensitivity of CSB (100% for CSB vs 60.9% for culture) stain is definitely superior to culture in rapid diagnosis of P. versicolor. CSB dye has been reported to be corrosive on contact. Hence, it is advisable to use protective gloves while handling the stain, although low concentrations, as has been used in our study, are unlikely to cause any significant problem. To conclude, CSB stain is a rapid, sensitive and qualitatively superior method as compared to KOH mount and culture in the diagnosis of P. versicolor. It is easy to perform and requires only an ordinary light microscope. A 30 ml bottle of CSB, enough for 500 smears, costs approximately Rs 2600. Hence, CSB stain can be easily used as a cost effective, office based test for rapid diagnosis of P. versicolor. Hay RJ, Ashbee HR. Mycology. In: Burns T, Breathnach S, Cox N, Griffiths C, editors. Rook's textbook of dermatology. 8 th ed, Vol. 2. West Sussex: Wiley-Blackwell; 2010. p. 36.1-36.93. Ghosh SK, Dey SK, Saha I, Barbhuiya JN, Ghosh A, Roy AK. et al. Pityriasis versicolor: A clinicomycological and epidemiological study from a tertiary care hospital. Indian J Dermatol 2008;53:182-5. Shah A, Koticha A, Ubale M, Wanjare S, Mehta P, Khopkar U. Identification and speciation of Malassezia in patients clinically suspected of having pityriasis versicolor. Indian J Dermatol 2013;58:239. Gupta AK, Kohli Y, Summerbell RC. Molecular differentiation of seven Malassezia species. J Clin Microbiol 2000;38:1869-75. Kabbin JS, Vijaya D, Meundi MD, Leelavathi B. A clinicomycological study of pityriasis versicolor with special reference to the calcofluor white stain. J Clin Diagn Res 2011;5:1356-8. Lim SL, Lim CS. New contrast stain for the rapid diagnosis of pityriasis versicolor. Arch Dermatol 2008;144:1058-9. Fonseka S, Lim SH, Bandara U, Dissanayake M. New contrast stain for the rapid diagnosis of dermatophytes and pityriasis versicolor. Labmedicine 2011;42:649-52. Lim CS, Lim SL. Practical tip: Chicago Sky Blue (CSB) stain can be added to the routine potassium hydroxide (KOH) wet-mount to provide a color contrast and facilitate the diagnosis of dermatomycoses. Dermatol Online J 2011;17:11. Lim CS, Lim SL. New Contrast Stain for the Rapid Diagnosis of Dermatophytic and Candidal Dermatomycoses. Arch Dermatol 2008;144:1228-9. Tambosis E, Lim C. A comparison of the contrast stains, Chicago blue, chlorazole black, and Parker ink, for the rapid diagnosis of skin and nail infections. Int J Dermatol 2012;51:935-8. Chicago Sky Blue 6B stain is a new contrast stain which can be used as a rapid, sensitive, cost effective method for diagnosis of pityriasis versicolor.